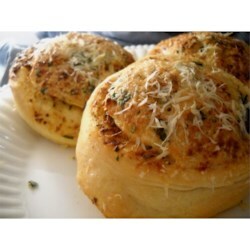 "These garlic and Parmesan cheese dinner rolls are really great  crusty and cheesy on the outside, tender and garlicky inside, and visually gorgeous." Mix yeast, 1/2 cup of flour, sugar, and warm water in a bowl. Cover and let rest in a warm place until bubbling, about 15 to 20 minutes. Stir in salt, olive oil, and egg. Mix thoroughly and stir in remaining 1 3/4 cup flour to form a loose, sticky dough that pulls away from the sides of the bowl. Cover with a damp towel and let rise in a warm place until doubled in size, about 1 to 1 1/2 hours. Punch down and scrape the dough from the sides of the bowl. Turn onto a lightly floured surface. Sprinkle with more flour and shape into a rectangle. Roll out to an approximately 10x12-inch rectangle, about 1/2-inch thick. Brush with melted butter; sprinkle with garlic, Parmagiano-Reggiano cheese, black pepper, cayenne, and parsley. Press flat one long edge of the rectangle and brush with water. From the opposite end, roll evenly into a log. Press the seam together to seal. Cut into 8 rolls. Transfer to a baking sheet, cut side up. If necessary, cut an ‘X' in the top of each roll to expose filling. Brush each roll with olive oil. Sprinkle with more cheese. Cover and let rise until slightly puffed, about 20 to 30 minutes. Bake in preheated oven until the tops are golden brown, about 20 minutes. See how to make delicious no-knead dinner rolls. I love making homemade fresh dinner rolls, it really isn't as intimidating as it seems. These turned out awesome, I did not change a thing!! !